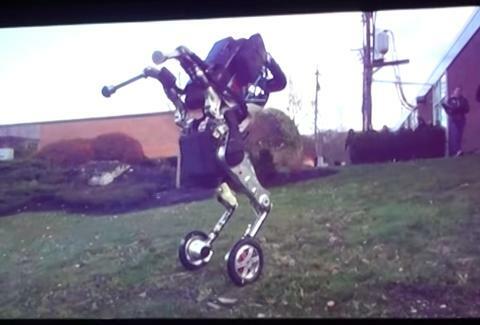 Boston Dynamics has been unveiling its freaky robot designs to the public for the better part of a decade, and thanks to a leaked video, we've gotten a glimpse at its freakiest creation yet. Say hello to Handle: a robot with the legs of a goat, the wheels of a scooter, and the soulless efficiency of your worst nightmares. In the leaked video, Boston Dynamics founder Marc Raibert introduced the company's new design as "what I think will be a nightmare-inducing robot," and he's not wrong. There's something off-putting about the way Handle maneuvers around like a headless, goat-legged rollerblader, bearing a striking resemblance to the Jersey Devil (if he had wheels instead of hooves). As Raibert explains, Handle is an "experiment in combining wheels with legs, with a very dynamic system that is balancing itself all the time and has a lot of knowledge of how to throw its weight around." The original video, which has since been edited to blur out the monstrous robot at BD's request, shows Handle navigating smoothly on a level surface before straight-up hurdling over an obstacle at full speed without breaking a sweat -- not that it can sweat, because it's a robot. It even manages to negotiate its way down a grassy hill without much difficulty, which is a testament to the technology at work here. Oh, and it's called "Handle" because it's eventually supposed to be able to handle objects -- like, say, a laser pistol, or the severed head of its creator. Now would be a good time to learn how to speak robot.